I guess some Tattoo Artists just have no scruples. A customer comes into your tattoo salon wanting some words done in Hebrew. 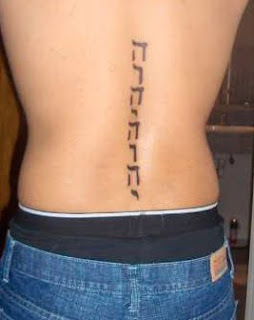 You don't know Hebrew, but worked on some Hebrew tattoos here and there, so you can surely manage! $50 please. This guy thought he was getting "Earth Water Fire Wind" tattooed in Hebrew. What he actually got is something quite different. His tattoo is in fact God's sacred name - YHWH, twice, backwards and without proper spacing. "Ho He Ho He!" Santa's laughing behind the fellow's back. Must have been some light-weight gasses in the air when this was done...and this tattoo is 'the living-proof', (Ha'ho'kha'ha) of it. I should add 'my sympathies', actually: There but for misfortune could go anyone. Oh yes, you're definitely onto something here! I also thought it was a laughing santa tatoo special for the Xmas season. P.S. I love this blog! If this puppy had truly wanted GOD's name on his back he should have gone with English. Maximum, (or 'minimum', as I continually correct the local natives) it at least spells something in either direction. Where do you find these tattoos?? Even if someone didn't know Hebrew at all, it should have been obvious that this tattoo didn't say "Earth, Water, Fire, Wind". This is just a string of Hebrew letters, with Heh repeated four times. There are no spaces between words, because there are no words. It shows just how many people get Hebrew tattoos with absolutely no knowledge of Hebrew at all. It's amazing. Does this happen with other languages, or just Hebrew?! Definitely not just Hebrew. Have you seen the Hieroglyph Tattoos site? I thought it was HayaHoveYihye at first sight.